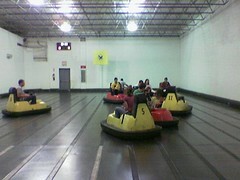 WhirlyBall is an awesome mix between bumper cars, jai-alai, polo, basketball, and lacrosse. Two-teams, everyone with a small, hand-held basket, throwing around a wiffle-ball. The objective is to throw the wiffleball into your "net" at either end of the court. It's also suprisingly tiring. Your side muscles get tired from diving over the side of the car for the ball.